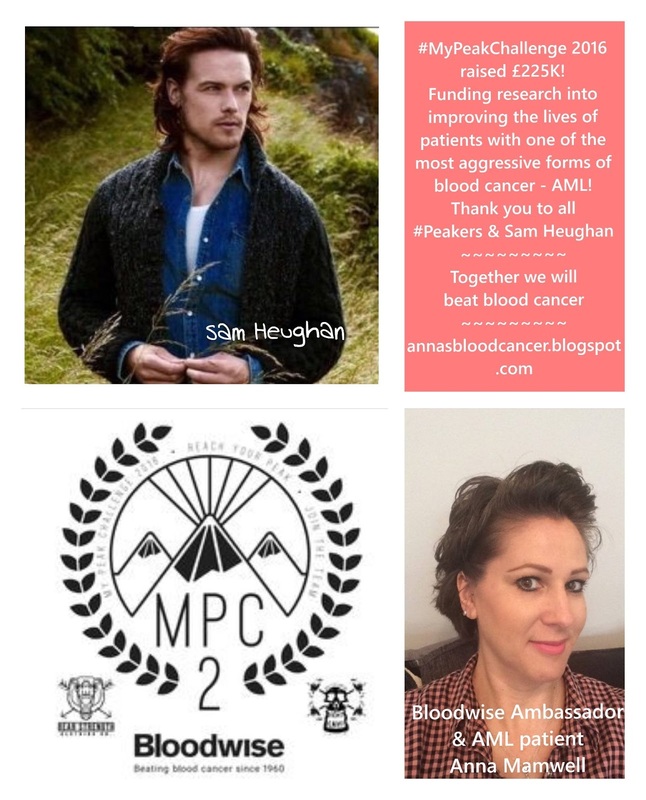 Scottish actor, Sam Heughan, who is currently starring in Outlander is a Bloodwise supporter and has done a lot for the charity over the past few years. He started My Peak Challenge which I was asked to take part in this year! And the good news is that all the money raised during this year’s challenge is going towards research into improving the lives of Acute Myeloid Leukaemia patients. AML is the blood cancer I was diagnosed with so this makes this year’s challenge a lot more personal for me. Read below for more on My Peak Challenge and what was involved. You could take part next year too! Leukaemia patient and Bloodwise blogger Anna Mamwell is celebrating the end of her treatment by taking part in My Peak Challenge in support of the charity. The 40 year-old has set herself the target of reaching 10,000 views of her blog about life with leukaemia, to raise awareness of the disease and as part of the national fundraising campaign which encourages individuals to choose their own challenge to carry out during May whilst raising money for Bloodwise. My Peak Challenge was created by Scottish actor and star of hit TV series Outlander, Sam Heughan. Since its began in 2015, it has raised over £200,000 for Bloodwise, the charity Sam has supported for a number of years. “I had been feeling ill with flu-like symptoms so booked an appointment with a nurse, who gave me antibiotics and suggested a blood test. Later that evening my GP called to say there was an abnormality in my blood and that I needed to go to hospital immediately. Even at that point I didn’t think it could be cancer. “One of the hardest things about having blood cancer was feeling totally out of my depth as a parent to our daughter. I missed her first dance show as I was in hospital under neutropenic care and I was often too ill to speak with her or comfort her as a mother should. “As well as sharing cancer’s ‘other side’, this blog is my way of raising awareness of blood cancer symptoms, as early diagnosis is crucial.” she continues. Andy Jackson, who was diagnosed with chronic myeloid leukaemia in 2003 and is now Digital Patient Experience Officer at Bloodwise, says: “When you are diagnosed with something like blood cancer you sometimes don’t know where to turn or what to feel. It can all be a little overwhelming and the terminology and procedures being explained to you are scary and often explained in terms that you don’t immediately understand. To read and share Anna’s blog please visit www.annasbloodcancer.blogspot.com. To find out more about My Peak Challenge please visit www.mypeakchallenge.co.uk. Next Post Stomach Churning Check Ups!